Every Friday during the NFL season, the Buffalo News runs staff picks for the football games that weekend. This season, I’ve been picking the winners as well. Or something like that. Lately, my picks have been the losers, not the winners. To make a long story short, that is completely unacceptable. I won’t stand for losing. I need to turn things around with these picks. I’m a numbers guy, so a retrospective study seemed in order. I looked at every game this season to see which categories of teams (home, road, favorites, underdogs) are winning games against the spread and which are losing them. 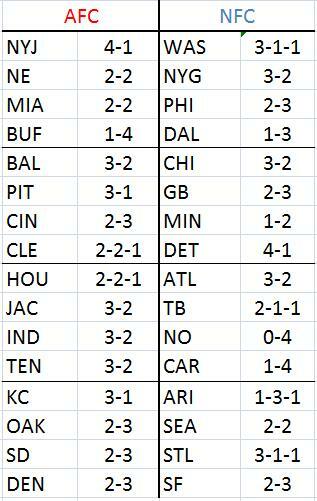 I also looked at combinations of the two: Home favorites, home underdogs, road favorites and road underdogs. Lastly, there is a chart of every NFL team’s record this year against the spread (all spreads are in accordance with Buffalo News picks). Here’s what I found–the records for every game this season*. *Buffalo News didn’t pick the opening game of the year, Vikings @ Saints, so I didn’t either. You may also find some weeks have more games than others–this is due to bye weeks, games that resulted in a push, or games that had no line (PK; only one this year was Jacksonville @ Buffalo). As you can see, the underdogs–teams who get points added to their score–are by far the most successful group so far this season. Home teams did very well Weeks 1 and 2, but really curved off since; and now have a losing record on the year against the spread. When I looked closer, I found even stronger numbers saying the teams getting points are the ones that win games. What this means is either that the teams we perceive as “very good” really aren’t that strong, or teams we expect to get pummeled end up playing a good game. I think a lot of my problems picking games with lines comes from growing up being a Bills fan. Close games aren’t exactly something I’m used to seeing. We’re usually getting blown out. I noticed that my picks against the spread are largely the same teams I would pick as outright winners. Since the Bills were always getting crushed, I subconsciously expect every bad team to get wrecked, and conversely, every good team to win big. In reality, most football games are a lot closer than I expect. I remember looking at the game lines in the paper a few years ago and thinking “that’s it?” Turns out five or six is a significant difference in a football game. Finally, here are the numbers for every NFL team this season against the spread. You’ll be surprised with some teams. Teams are ordered by their standings according to actual win-loss record. I expected Kansas City to have a good record, but not Detroit or St. Louis or Washington. I also expected Buffalo and Dallas to be near the bottom, but not New Orleans. Arizona, who (somehow) sits atop the NFC West, is last in the division in record against the spread. The Lions, who won their first game of the year last week, have lost only once with the spread. I’ll also mention the lowly Bills. Their only win so far was at New England, where they were expected to lose by nearly two touchdowns. Fitzpatick kept the game competitive in his first start this year. So, to answer the big question, how do you pick a winner? It’s still a very inexact science. A lot of it is like picking games in the NCAA tournament: It’s going to come down to one play or one call, and that is going to make all the difference in the outcome. Brett Favre’s pick-6 in the last minutes against the Jets gave New York enough points to cover the spread. 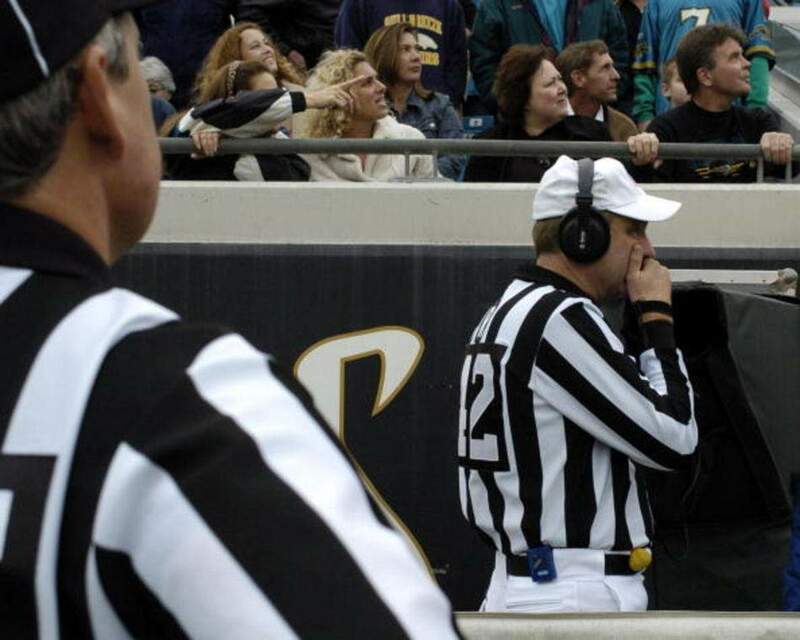 You can’t predict that stuff (okay, maybe you could have called a Favre INT, but you know what I mean). There’s always more research that can be done, but that may not be practical given your time constraints. In the end, all you have is your gut feeling. Every week so far, the underdogs have had a winning record. When in doubt, don’t put your money on the team getting points taken off the scoreboard. 4-10. Hopefully this study will turn things around for me.